Visitors to Luisa Lambri’s Being there will be presented with the option to “check out” guitarists Eric Klerks and Dylan McKenzie to walk with them through the exhibitions. 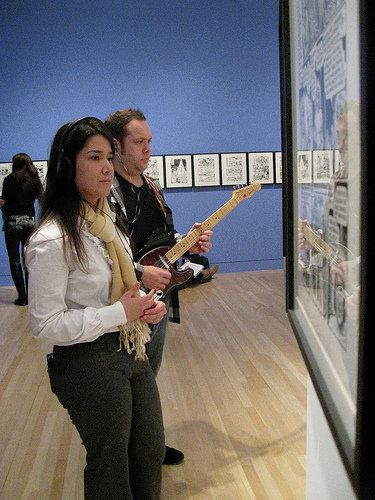 Klerks and McKenzie will follow individual visitors around, playing live music into headphones through which only that visitor can hear. DanRae Wilson and Miriam Jones pair brief puppet shows (3-5 minutes) in the Little William Theater with longer shows (5-7 minutes) at half past each hour that will be performed from inside the Little William Theater with only the top part of the door open. The two pieces will work in tandem -- exploring the ephemeral, transitory nature of a time-based event juxtaposed with the hearty tradition of vaudeville style puppetry a la Punch and Judy. Laura Steenberge and Catherine Lamb, leaders of the experimental women’s choir Singing by Numbers, will perform in the Luisa Lambri galleries and will also welcome visitors to partake in singing workshops on Lindbrook Terrace. Laura and Cat are interested in exploring the physics of sound waves through voice and in conducting experiments in new methods of teaching singing in harmony to musicians and non-musicians alike.